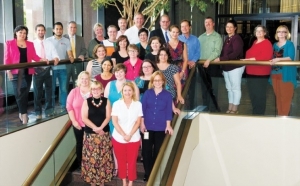 GableGotwals has been named as one of the 2014 Best Places to Work in Oklahoma. The annual list of “Best Places to Work” was created by okc.BIZ and Best Companies Group. This survey and award program was designed to identify, recognize and honor the best places of employment in Oklahoma, benefiting the state’s economy, its work force and businesses. The Best Places to Work in Oklahoma list is made up of a total of 35 companies, in two size categories: 18 small/medium size employers (fewer than 249 employees) and 17 large-sized employers (more than 250 employees). GableGotwals has been named one of the Best Places to Work in Oklahoma in the small/medium category. This is the fifth year the law firm has been recognized and is the only law firm to have ever been honored. Organizations from across the state entered the two-part survey process to determine the Best Places to Work in Oklahoma. The first part consisted of evaluating each nominated company’s workplace policies, practices, philosophy, systems and demographics. The second part consisted of an employee survey to measure the employee experience. The combined scores determined the top organizations and the final ranking. Best Companies Group managed the overall registration, survey and analysis process and determined the final rankings. For more information on the Best Places to Work in Oklahoma program, visit www.BestPlacesToWorkOK.com.